Sora Article is a minimal Theme designed for blogger. It provides many features that blogger will love it. Sticky post, Social share in each post, many post formats such as Video, Audio, Soundcloud(audio). 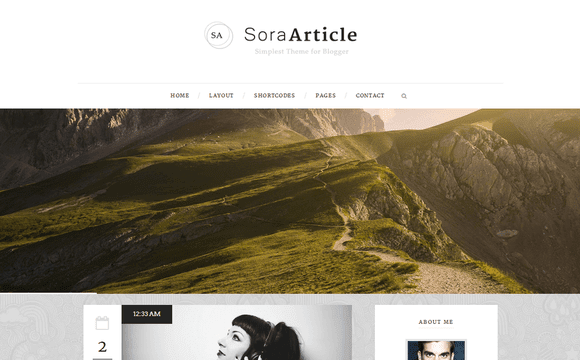 Sora Article is equipped with various of widgets which will help you to publish your blog more professionally. To make it easy for you we have published this detailed documentation, so that you can setup your blog correctly. You have made a good decision by choosing our template. You can check the live demo or download the template through the button below and also Please Read this documentation carefully in order to set up your blog and please note that there’s no support for free users. Change the the code in red color with your image link. Change the "Morbi leo risus, porta ac consectetur ac, vestibulum at eros. Fusce dapibus, tellus ac cursus commodo, tortor mauris condimentum nibh, ut fermentum massa justo sit amet risus." with your own details. Change the value of var pageCount=3; from 3 to any number you want. any other simple template like this one? I have followed all of these instructions for setting up this template on my blog. But, I have one element that I cannot figure out. For some reason, the text on the "Post Author" section under the blog posts is not pulling from my Google+ profile and I cannot figure out how or where in the HTML code to change it to either do that or contain custom text. That text is not automatically generated, you have to change it manually.